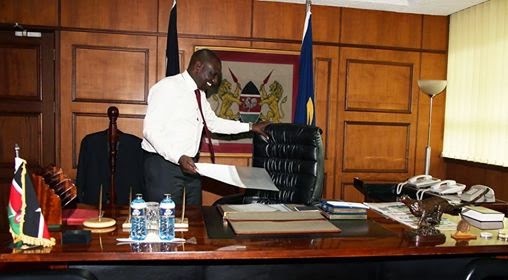 Deputy President of Kenya, - who is now the Acting President - William Ruto, getting ready to occupy the seat of the Presidency. Ruto takes the office as the President of Kenya,as Uhuru Kenyatta attends the international tribunal in The Hague. Kenyatta is implicated in organizing post-election violence in 2007, charges that he denies.